Happy almost Friday loves! Sorry for my slow replies and absence the past few days, I'm finally feeling like a human being again so I'm ready for the weekend. I didn't step a single foot outside for two whole days this week so I'm hoping we have some nice weather this weekend that I can sit outside and enjoy. Speaking of nice weather, I got to experience some gorgeous fall/winter like temperatures while I was out in New Mexico visiting my parents a few weeks ago so I took full advantage while I was out there. Of course it's most likely the cause of why I got sick but I won't hold it against them. One of the things I loved most about New Mexico was how sunny it was. Supposedly I live in the Sunshine State but even on it's sunniest day in Florida, I feel like it's not even half as bright as it was in New Mexico. These pictures were taken at about 4 pm and you can still see how crazy bright everything was. So I apologize that these are a little washed out, I had my white balance settings for Florida sun, not the crazy strong New Mexico sun. Now on to my outfit... I wore this outfit out to dinner my first night out there and I also wore it traveling all day. This striped jersey top is super comfy for traveling and everyday and you all know how much I love stripes! 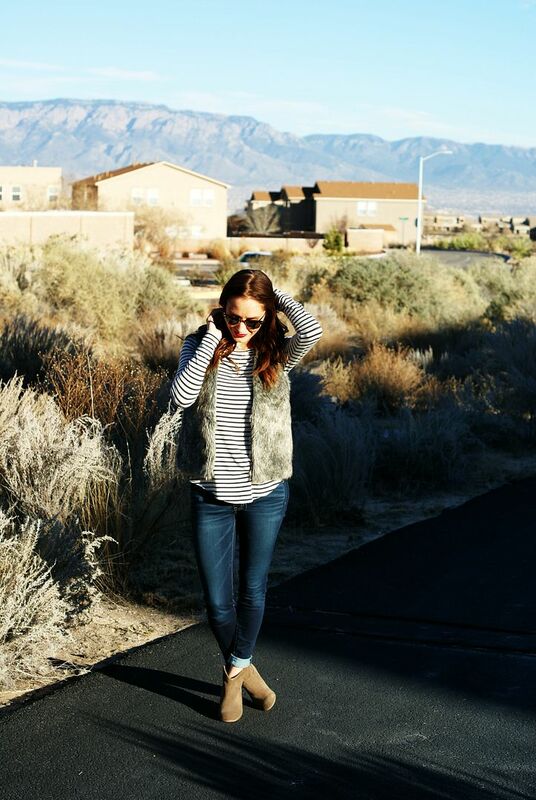 Then I topped off my look with a faux fur vest since it was a little chilly, especially in the shade and my most comfy pair of booties since I knew I was going to be walking around! Hope everyone has a great day! The fur and stripes are so cute together! Looks great on you! Your fur vest looks really nice--Ive seen some cheap ones that looks gross. Love the pairing of it with the stripes! Such a cute, easy look! I love a great fur vest! Such a perfect outfit! I just love the stripes! Glad you're feeling better! That warmth looks amazing as I sit here in Kansas typing and shivering! This is such a chic combo! I hope you have a great rest of the week. i love this whole thing. what a gorg backdrop too! the stripes with the fur - perfection :) i think the pics still turned out great! Glad you are finally feeling better! Love the gorgeous background of these shots! The fur and stripes are perfect together! You KNOW I'm loving that vest, lady! It takes a special personality to rock the fur, and you are rocking it! 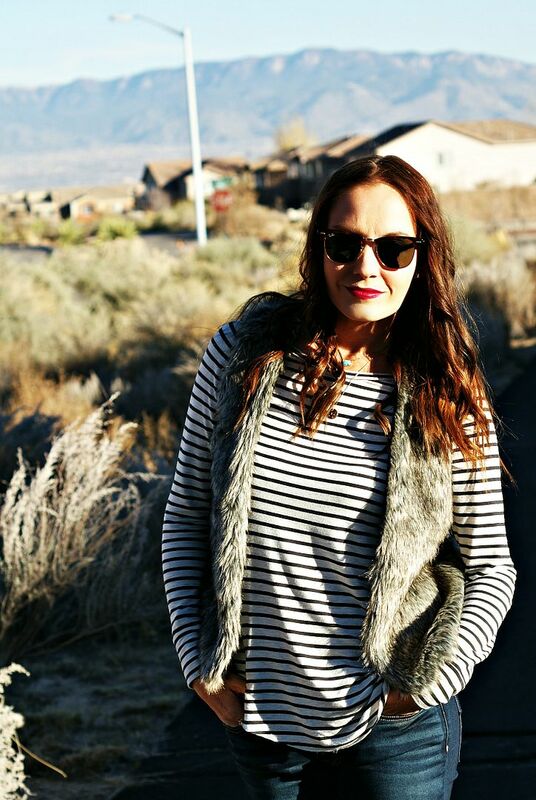 I love a good striped shirt with a fur vest, love it all! hope you're feeling better! i feel like i'm way behind on everything. loving those stripes!!! Stripes are on repeat for me this season. 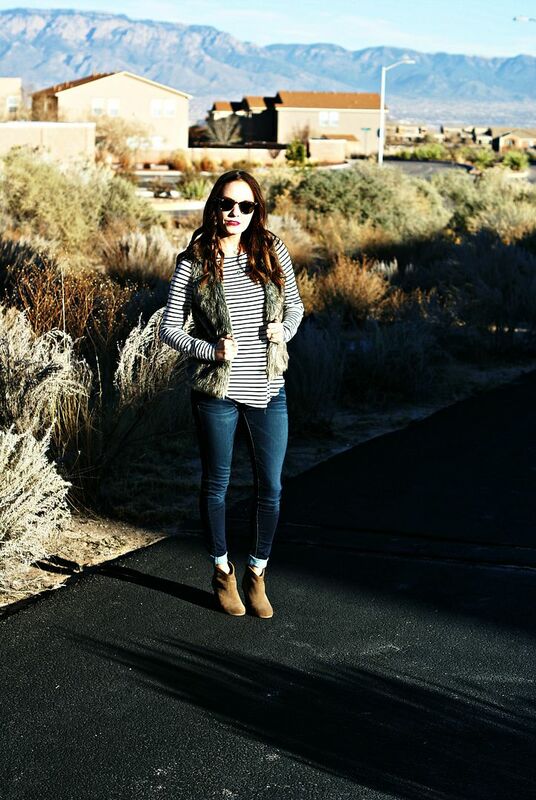 And that vest is perfect for layering over anything!! This is one of my go-to outfits! So comfy, but still so cute! Glad you're feeling better! Such a cute outfit for the weather there especially the vest! I'm loving the NM background too...so pretty! Hope you're feeling better. Stripes and fur are definitely my favorite! 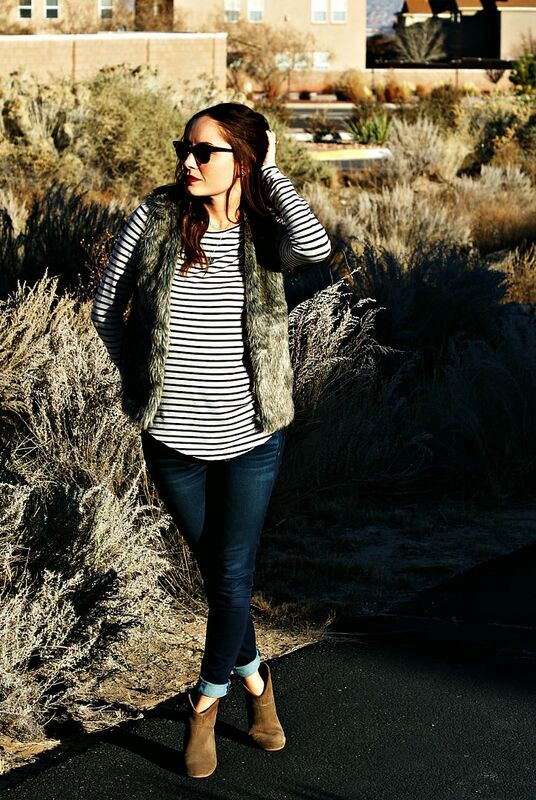 Fur and stripes are one of my fav combos! I haven't met a striped shirt I haven't liked yet! This one looks great on you! It really was bright in New Mexico! 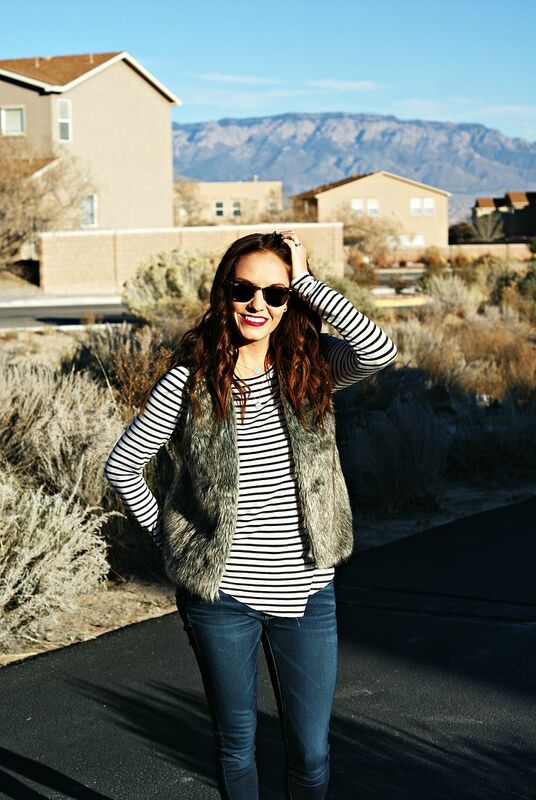 I love how you paired the vest with the stripes! It's such a cute and effortless dressed up look! Such a cute look! I haven't been into an American Eagle in forever, I need to change that. Glad to hear you're feeling better! Stripes and fur are meant to be. I can never have enough of either!! Cute! I love New Mexico and you are right...Something about the sun out west is just different! Glad you are feeling better. I've been home all week nursing two kids with stomach bugs. NO FUN. At least (knock on wood) I have not gotten it. Love the outfit, I have really been liking stripes lately as well as faux fur, hence buying a faux fur coat which I wear all the time. oooh that top is fun! you can never have too many striped tops. and those booties are obviously fabulous! they are my faves. What a classic and trendy combo the stripes with the fur is!! Love this combo, you look great! Oh girlie! Hate that you're still sick! You poor thing! Love this vest- that's a great combo! Hope you have a great Friday! loving your look! I'm obsessed with stripes! Such a perfect look for sightseeing in New Mexico!! I just love the look and warmth of a vest and this one is super cute!! Glad you are feeling better! !